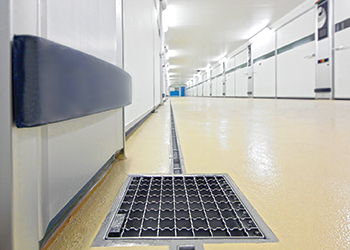 ACO drainage systems ... hygiene focused. In line with its commitment to HSE (health, safety and environment), ACO has embarked on a drive to ensure hygienic performance and prevent bacterial contamination in kitchen drainage systems. Towards this end, the global leader in surface drainage systems has a dedicated website hygienefirst.com, highlighting the importance it accords to properly designed systems that use design principles reserved for the commercial kitchens and food and beverage (F&B) industry. Drainage systems are prone to harbour listeria bacteria and can be a source of food contamination, says a company spokesman. However, as they are often out of sight, they tend to be out of mind. Poorly specified drainage leads to costly ongoing cleaning and maintenance and, at worst, it can result in food contamination, he adds. “ACO designs solutions with cost efficiency in mind but with absolutely no compromise in terms of food safety,” he says. The company’s drainage systems have been intelligently designed for the commercial kitchens and F&B industry to protect business and the environment. “They provide the highest standard of hygiene to prevent harmful bacterial contamination. ACO applies hygienic design standards reserved for food contact surfaces EN 1672 and EN ISO 14159 to its drainage products. “Our complete portfolio allows us to safely control water as it passes along the system to ensure it can be ecologically and economically reused in a viable way,” the spokesman says. ACO Group is a global world leader in the manufacturing and supply of corrosion-resistant polymer concrete, stainless steel and plastic, internal and external surface drainage systems. “Our aim is to constantly improve every aspect of safety, hygiene and functional performance. We believe our systems and services are truly unique, delivering unparalleled benefits to everyone involved in project delivery or subsequent operation,” he concludes. The company also supplies intelligent solutions for grease, oil and starch separation, as well as waste water management systems for the treatment and reuse of black water. ACO products are specified in many market sectors, such as hotels, restaurants, F&B industry, road construction, airports, sports stadiums, and open-air architectural and landscaping structures. They have been specified for several major projects in the UAE, such as Ferrari World, Yas Marina Hotel, Masdar City, Presidential Palace, Capital Plaza in Abu Dhabi; and Burj Al Arab, Dubai Marina District, Emirates Group headquarter and Emirates Flight Catering, Dubai Festival City, Palm Jumeirah, Dubai Mall and Mall of the Emirates, Dubai Maritime City, Meydan Race Course, Dubai Metro Stations, Wafi City Mall, and Dubai International Airport in Dubai. In Bahrain, the North Manama Bridge and Kempinski Hotel at Bahrain City Centre are some of the projects where ACO products have been installed. Projects in Qatar include Dukhan Highway, Muntazah Expressway, Khalifa Stadium, Regent Hotel, and more. Projects in Saudi Arabia include Princess Nora University complex, Kingdom Centre and King Abdullah Financial District in Riyadh and Makkah Clock Tower and the Grand Mosque expansion in Makkah. In the region, the company operates as ACO Systems FZE, which has a warehouse, manufacturing facility for drainage systems in stainless steel and an office in Jebel Ali Free Zone, Dubai, and provides services and support throughout the region for ACO distributors and its customers.